Unique and patriotic mens handkerchief gift featuring the Scottish Saltire Flag national emblem embroidered. Unique and patriotic mens handkerchief gift featuring the Scottish Saltire Flag national emblem embroidered. Every gentleman should have a real cotton handkerchief personalised with a name or initials. A stunning blue and white Scotland saltire flag motif embroidered onto your choice of a Single hanky or a Gift Set of 3 hankies. 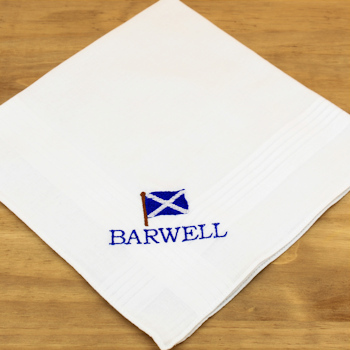 We offer as standard a mens Standard White Cotton handkerchief approx 38cm x 38cm. Optional Gift Presentation: Have your handkerchiefs in a organza gift bag, a pop up pillow box, or a classic gift box.